There's a bunch of stuff in the trails plan report, especially about the current and potential economic activity that trails create in the form of tourism and property values. We don't really get into that below, but it's worth checking out the details in the report if you're curious. 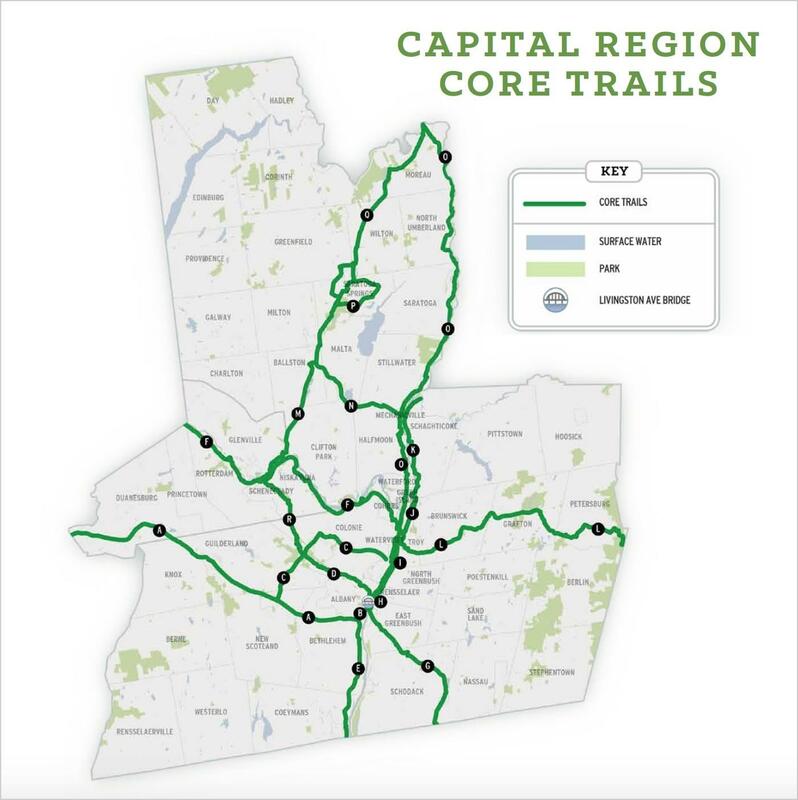 The trails plan identifies current trail segments around the Capital Region -- and many more potential trails. 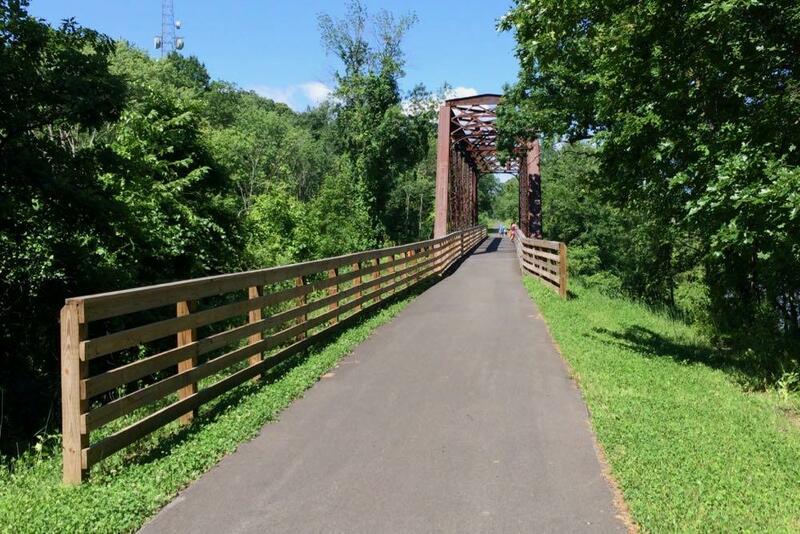 To help provide some structure to this big list of trails, Jennifer Ceponis said the team behind the report analyzed the potential impact of trails and identified 18 core trails for the regional network. Some of these trails already exist, such as the Mohawk Hudson Bike-Hike Trail, and currently include about 90 miles of trail. Others are in planning with construction dates, and others are just initial concepts. If all the core trails were constructed, they'd include almost 290 miles of path. Over the last decade or so the region has been adding, on average, about 7 miles of trail per year. The goal, Ceponis said, is to provide an outline for continuous, incremental progress toward building out the trails network and to add something more like 10 miles per year over 20 years. "I know it's frustrating to look at the map and see all these pieces of spaghetti that don't actually make connections," she said during a break in a public open house for the plan last week at the Discover Albany Visitors Center. "But it's also an opportunity, and our past track record shows that we can keep making this progress." Among the recent reasons for optimism toward the goal: The state's support of the Empire State Trail project, which aims to create a 750-mile bike route from to New York City to Canada and from Buffalo to Albany. Another goal of the plan: To build connections between the trails that already exist in the region. And in many cases, that doesn't require some long new trail -- it's just a matter of covering a gap of a mile or two. 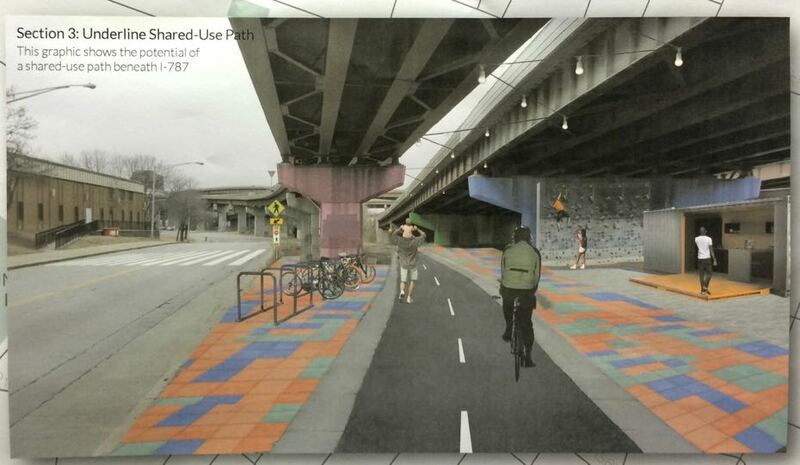 The planned South End Bikeway Connector in Albany is a prime example (that's a rendering above). The roughly two-mile route will run from the end of the Helderberg-Hudson Rail Trail on South Pearl Street north to the Mohawk Hudson Bike-Hike Trail on the riverfront. Connecting the two trails will help form the larger network, making the paths more valuable for all sorts of users. 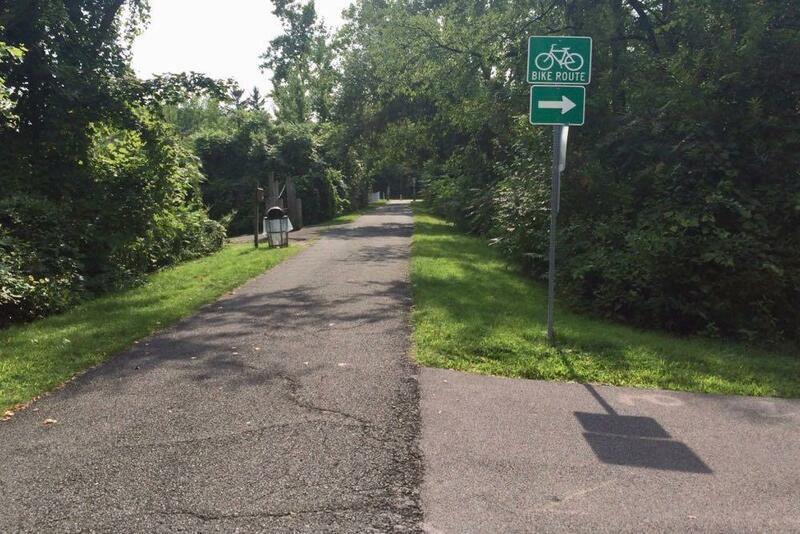 CDTC's Jennifer Ceponis said these sorts of connector paths are also often in neighborhoods that could use more access to trails and safe transportation amenities. "The trails are for everyone in our region and our communities," she said. "And we want everyone to feel connected to the trail system and and everyone to feel like they have safe access to it, to feel welcomed and to connect all communities, not just a select few." Maybe the most important potential connector of all connectors in the Capital Region trail system is the Livingston Avenue Bridge that spans the Hudson River between Albany and Rensselaer because that spot is shaping up to be a major node in the whole network. "It is the only opportunity for us to connect bicycles and pedestrians, to provide ADA accessible access and connection, across the river," said Ceponis. "And they're going to have to replace it. And when they do they have to provide a path for walking and biking." What makes the Livingston Ave Bridge so attractive as a potential crossing for bikes and pedestrians is that the train bridge sits relatively close to ground level, unlike the Dunn Memorial Bridge. It can do that because it has a swing section that opens to allow ships to pass. The Mohawk Hudson Bike-Hike Trail already passes right by the bridge's Albany side. The planned Albany-Hudson Electric Trail, which will run from Rensselaer, is in line to start construction next year. 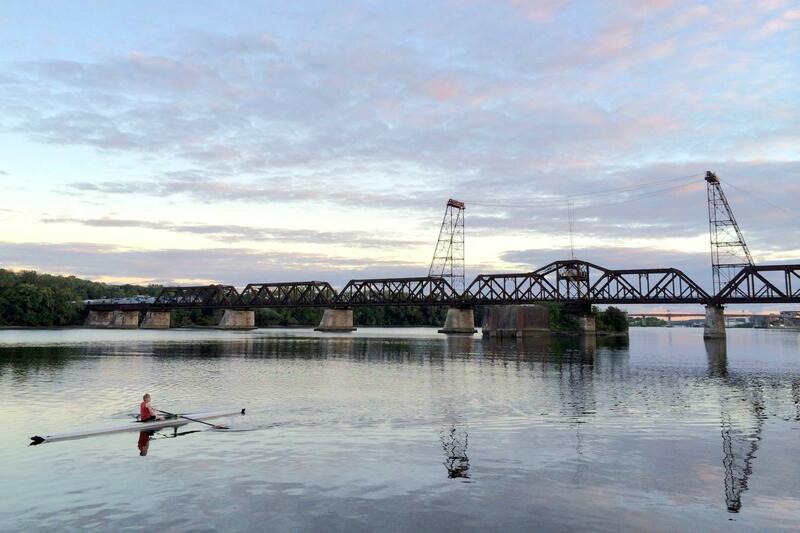 The proposed Rensselaer Riverwalk/RPI Trail would run from the Rensselaer end to Troy. And the Albany Skyway could also someday connect to a path over the bridge. Helderberg-Hudson Rail Trail future extension? 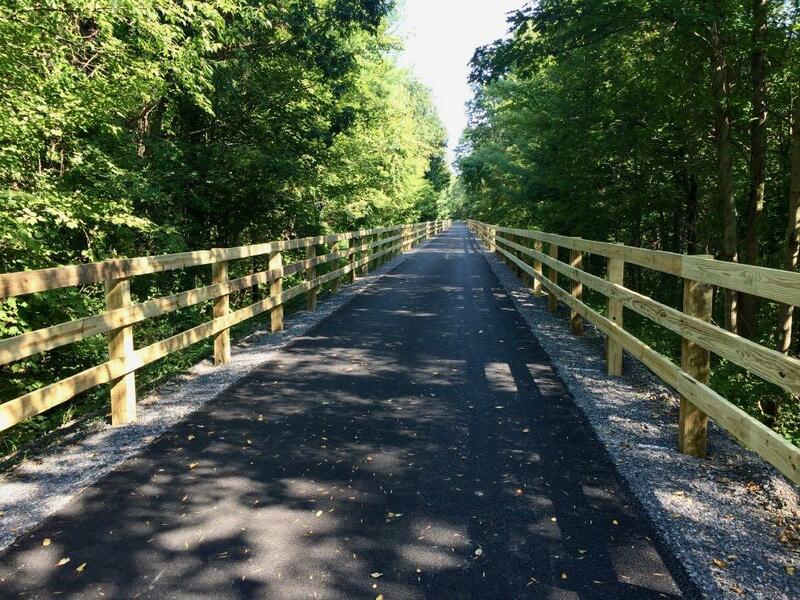 The Helderberg-Hudson Rail Trail, which runs 9 miles from Albany to Voorheesville, is only a few years old, but it's already very popular. So it's interesting to see that the Capital District Trails Plan raises the possibility of extending the trail to Altamont and, eventually, even all the way out to Schenectady and Schoharie counties. There's a rail line along the corridor that could make that possible -- either as "rail to trail" or "rail with trail." Jennifer Ceponis said CDTC hasn't approached the railroad that owns the corridor, yet, so this idea is potentially years in the future. But as she pointed out, there's no guarantee it will be an active rail line forever. "So even though something's there today we have to be able to envision a future where it's not." This idea has been around for years. There's even a project report floating around online from a decade or so ago. There are some interesting angles to this potential trail: a connection between Six Mile Waterworks and the Hudson River, connecting multiple neighborhoods along the path, opening access to a not-small stretch of land that currently only exists as a sort of lost interstitial space. It's something to keep an eye on. Past the discussions about things like socio-economic benefits and all the maps, the Capital District Trails Plan also includes a section with examples of how people got trails built, both here and other places. The intent is to get people involved in planning -- and advocating for -- these sorts of paths. "No one should wait for local and elected officials to take on this whole project or even one of the projects," said Jennifer Ceponis. "This vision requires champions and local support. Some trails will happen from a top-down approach, but a lot more will happen because of grassroots organizations and individual citizens." A pdf of the draft plan is embedded below. CDTC will be collecting public comments through October 15. Ms. Ceponis is very smart and very skilled. I am positive this trails plan bear fruit that will improve the region for many generations to come. These sorts of articles are always very exciting. Now if only the trails could be developed faster. good summary - thanks for emphasizing the Livingston Ave Bridge's importance.. it's necessary to restore what was available for hundreds of years before the 1970 to 1990 era of destruction / abandonment of existing, safe practical non-motorized crossings of the Hudson between Albany and Rensselaer. The RR Bridge walkway was simply abandoned without any public input, Also as part of I-767 and the South Mall interchanges, the street level lift bridge (also called Dunn Memorial), with excellent sidewalks and adequate shoulders for bikes, was destroyed to be replaced by the existing bridge that don't meet standards for bikes or ADA. Love walking and biking options. However, it is not a viable solution for transporting a large number of people, especially wtih the climate in this area. We continue deny the reality that rail based transit is the best option transporting significant numbers of people while reducing road congestion. Buses are nice and all, but will not be the solution either. Yes, it is expensive, but that does not mean it shouldn't be done.